To ensure all eligible students are provided safe, efficient and dependable transportation services to and from school that support a positive learning experience. Transportation provides transportation services for approximate 23,000+ eligible students in Shelby County. Students are transported on 340+ general and special education buses traveling approximately 29,981+ miles per day. Buses are housed at four terminals throughout the county: Getwell (East), Kentucky (South), Farmville (North), and Grays Creek. Currently, SCS Transportation department has a staff of 9 employees to manage and support its vendor with safety, routing, and customer service needs.. Elementary students living 1.5 miles from the school and middle/high school students living 2.0 miles from school are eligible for transportation. Parents are encouraged to transport students that live inside the Parent Responsibility Zone (PRZ) or organize neighborhood walk groups where they can alternate supervision. Buses are scheduled to arrive on campus 15 minutes prior to bell time in the morning to ensure each rider has the option to eat breakfast. Buses are scheduled to arrive on campus 5 minutes before bell time for afternoon dismissal. Buses are scheduled to depart campus 10 minutes after bell time for afternoon dismissal. 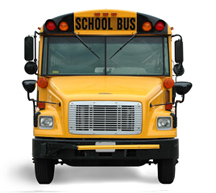 NOTE: All students must verify transportation eligibility at their assigned school after registering. Your patience is appreciated.